Liza (Kat Redstone) hovers precariously between change and self-destruction, between leaving her doomed relationship with girlfriend Sally and finding success with their band, Blanket. Sally (Sophie Anderson) works nights in a dead end job, clings to her fantasies of a better life and ignores the chaos all around her. Vin (Kai Brandon Ly) works as a rent boy, is secretly in love with Sally and in denial about everything else. Jamie (Collin Clay Chace) works nights in a gay cabaret bar, but longs to break free of his friends and their drug-infested dramas and settle down with a nice man. In the three days leading up to Liza's 25th birthday things finally come to a head between Liza and Sally. After a failed birthday dinner the four friends are plunged into emotional meltdown at an illegal rave. By the end of the night there's no going back to how things were, yet for Liza the uncertainty of the future has never been so appealing. Featuring music from emerging UK independent music talent: Plug, Micachu, Wet Dog, Peggy Sue, Sam Amant, Alan MX, The Raincoats, Scout Niblett plus Numbers and Sally and Liza's band Blanket, Break My Fall explores a metropolitan underbelly that thrives with life and danger, whose lost souls flit between midnight raves and morning fry-ups. This is Kanchi Wichmann's provocative ode to that 24 hour party culture and the lives and loves of London's East End. 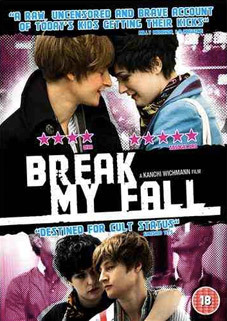 Break My Fall will be released on UK DVD by Peccadillo Pictures on 3rd October 2011 at the RRP of £16.99.